SOFT & COMFORTABLE: Made of deluxe foam pad wrapped by PU leather for softness, comfort and breathability; With a spacious sitting area of 35 x 35cm for extra cosiness. 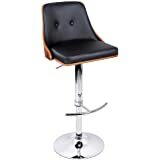 360°SWIVEL & ADJUSTABLE HEIGHT: The pivot that allows the seat to swivel moves well but not overly freely which makes the stool feel safe and gives you an easy comfortable body moving when talking with your friend right beside you; And also provides you a quick height adjustment by a delicate gas lift lever under the seat with no hassles. 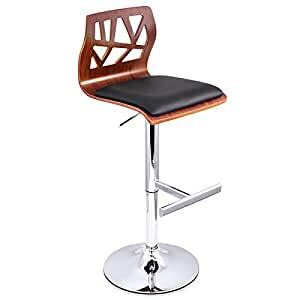 STURDY STRUCTURE: Well braced by wooden holder, anti-corrosion chrome finish steel base and footrest for an ultimate firmness, safety, and durability. 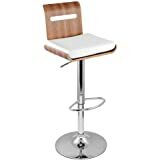 Besides, attached with anti-slip pads at the bottom of each stool foot to protect your floor from scratching. 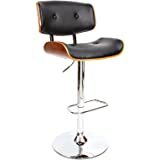 MODERN STYLE: A leather seat with contoured wooden backrest paired with a steel round bar stool base to creat a contemporary trend looking for an easy match with your other furniture; Ideal for home, kitchen, dining room, office, coffee shop, bar and so on. SIZE & WARRATNY: Seat Height: 98~108cm; We've got you covered 1-YEAR warranty and provide a customized and professional customer service before and after your purchase; please feel free to contact us if you have any trouble with this item. 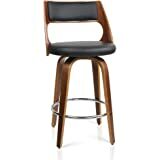 Designed to blend in with any environment, this bar stool serves the purpose of providing seating comfort along with a neat, simple design. Featuring an elegant wooden seat structure and beautiful chrome gas lift lever, it will surely complement your modern d?or. 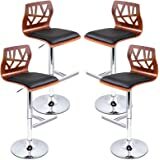 It also incorporates a quality chrome base with a PU leather padded seat providing long lasting furniture that offers maximum comfort. Contemporary and innovative, it isa beauty with assured quality.